I've tried another new desert just a few days ago. I saw it on Flavours magazine. Instead of just strawberries, I added blueberries because I don't have enough strawberries. I'll never buy the local Cameron strawberries from Tesco again - half of them were spoiled within 2 days. In a mixing bowl, combine the berries, vinegar and sugar; chill. 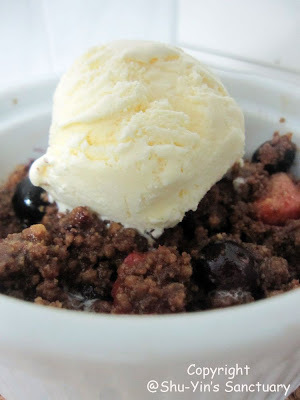 Preheat oven to 210 degree C.
In a mixing bowl, combine the crumble ingredients. Divide the berries among four heat-proof ramekins and top with the crumble. Bake for 8 to 10 minutes, until top is golden brown. Serve with vanilla or strawberry ice-cream is desired.